It’s charity Friday here at the Tasglann! Today’s photo is in honour of Movember, a charity that aims to change the face of mens health by asking participants to grow a mo’ for 30 days, and to gather as many sponserships as they can. Proceeds in the UK go to Prostate Cancer Charity (TPCC), the UK’s leading prostate cancer charity, though the event is global, with Mo Bros and Mo Sistas taking part from the UK, US, Canada, New Zealand, Ireland, Spain, South Africa, The Netherlands and Finland. The fine gentlemen of the Lewis Pipe Band above would be worthy of sponsership, particularly the man in the front row to the left. Well done sir, The Bandit would be proud. I looked at this photograph again the other day and thought to myself that it looked very much like the glasshouse that was attached to Lews Castle, and upon further research discovered it is indeed the ‘conservatorium’ circa 1905. I found more information in ‘Old Stornoway – a series of articles by Willie Spuds published in the Stornoway Gazette 1965-1973’ compiled by John Macqueen which is available from Stornoway Library. 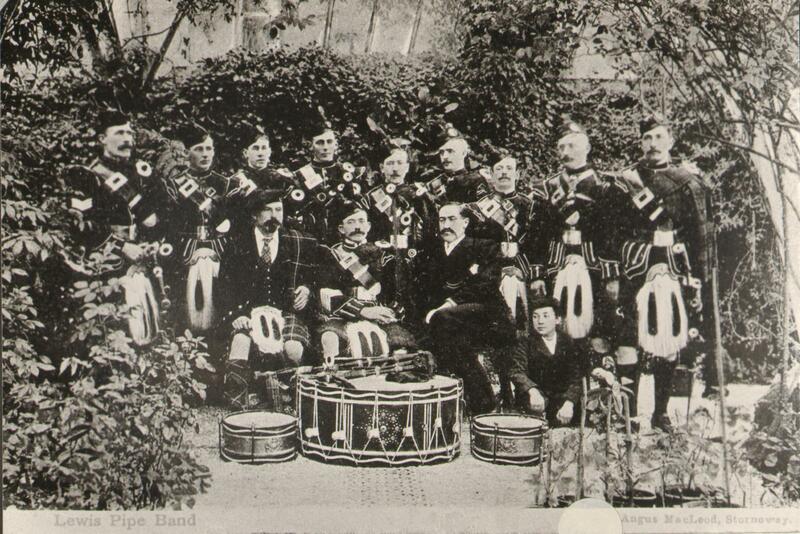 This entry was posted in Uncategorized and tagged charity, Lewis Pipe Band, Lews Castle, Movember, music. Bookmark the permalink.